The first time I disassembled a carburetor was at the entrance to Yellowstone Park. With an audience of buffalo, you really have an incentive to get it back together correctly. Individuals have been embarrassing themselves in front of the noble buffalo as long as people have driven the American West. I hoped to set the record straight. An experience like that will burn 'needle and float' into your brain with more clarity than a textbook ever could. Having seen that particular needle and float only one time, I can picture those components more clearly than I can imagine my morning cereal spoon. That is how you learn. With grease smudges on your forehead and semi-trucks whistling by, there is a hyper awareness that sears information to your brain as sure as instinct. But where do you start? After being invited to Foo Camp, I decided I wanted to bring something cool to show off and I thought it would be a clever way to get out of hosting a session. Plus, I have a backlog of projects that reach from here to the top of Jack's Beanstalk. Sometimes I think that I should create a list of all the projects, but that invariably leads to an upset stomach and an immediate desire to take a nap. 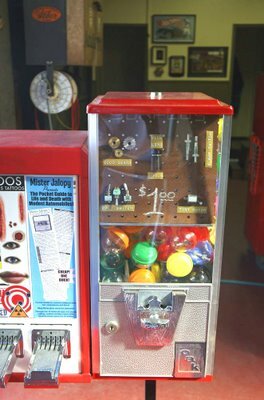 A favorite idea was to sell books in a standard bulk gumball and sticker machine. Small books. Very small books. A specific volume that would have just enough information to get you started on a new path in life. I have a shelf at home that is dedicated to inspirational books that open a foreign world and change you in a fundamental way. I am not talking about going to Morocco. I am talking about "Getting Started Right with Turkeys." Or "Shop Work on the Farm", "5 Acres and Independence", "Aircraft Sheet Metal Construction", "Locksmithing", "Your Self-Service Store" and "Backyard Poultry Farming". These books give a peek into what might be. One day, you are Joe Average. A nobody. End of the week comes and you are tending baby chicks and picking locks. A transformation has taken place. You are a giant. Granted, reading a book about building an Ideal Turkey Sunporch is no substitute for bringing home a gobbler. It is a just a starting point. And that's why I wrote Mister Jalopy's Pocket Guide to Life and Death with Modest Automobiles. It is just enough to get you started, to take you from "someday, maybe" to "aw, hell yeah. Let's just do it!" If you are new to old cars, you will pick up some hard earned tips that I wish I knew 12 years ago, but it will be nothing in comparison to the automobile knowledge you will absorb during the first week of old car ownership. toggle switches, tiny motors and even an Olympus lens from a microfiche machine. Well, it turns out the Foo Campers are much more interested in talking about innovation than buying innovation. The suite of vending machines grossed about ten dollars. Perhaps they would have been more interested in a version of Starting Right with Turkeys. Never one to let disastrous sales results dampen enthusiasm, Mark Fraunfelder suggested that we make the Pocket Guide available as the first title in the Boingboing Digital Emporium of DRM-free products. So, I reformatted it to fit a standard letter size sheet of paper and the pdf is available now for the same value price of one dollar. Same content in a slightly different format. 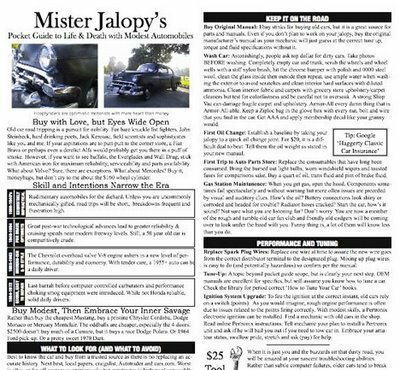 The joys of owning a jalopy could never be experienced without sitting in the driver's seat. A palpable dramatic tension is added to everything from cross-country road trips to neighborhood picnics when you are never sure if your car is going to start. Mishaps will leave you crying tears of hysterical laughter as you recount tales of tragedy narrowly avoided. It is a very visceral existence. If you spend two hours polishing the chrome bumper on your bucket, treat yourself to an In-N-Out burger at the Lankershim Blvd branch. Or a malted at your local dive. Or a cold beer on the side of a desert highway. You will be surprised how inspiring these moments can be. It makes you believe in everything.